Party Fun for Little Ones: Creating a licensed party in style! Creating a licensed party in style! As a parent i think its inevitable that one year or another (probably more!) our child is going to ask for a party theme of a licensed character. Something I often hear from Mums when their kids ask for a character party is ' uhhhh' or a straight out, we dont do licensed parties. I'll be honest and say I have had similar thoughts when one year Ethan wanted Ben 10 (he opted for Jungle instead though). I'm not sure what it is about licensed themes that sometimes gives this reaction, for me I think an image pops into my head straight away of everything looking exactly the same as on licensed products it tends to be the same image on each item - table cover, plates, cups, napkins, straws, party bags etc. This can often appear very busy and somewhat overpowering. Now, absolutely no judgment intended (we dont judge parties here, all parties are special and we understand the main point of a birthday celebration is not about the details) but today I want to try and show some ways to make your party beautiful and stylish but still incorporate a 'licensed' theme, that keeps both Mum and the special birthday child happy! 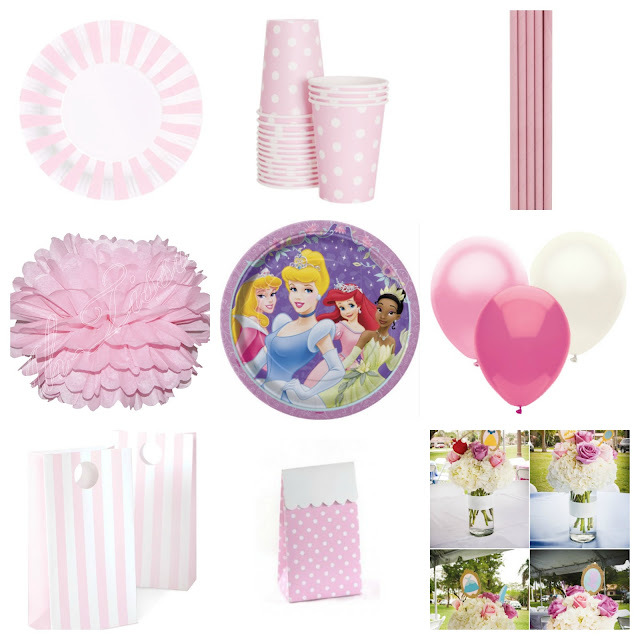 I'm going to use the theme ' Disney Princesses' as an example and show two different colour schemes, to create a party setting consisting of sit down table, party bags & decorations. I love creating a sit down table at my parties as I love the atmosphere it creates when all children sit down to eat together. I believe less is more and like to set a mostly plain setting and then tie in the theme by way of themed plates and centerpieces. 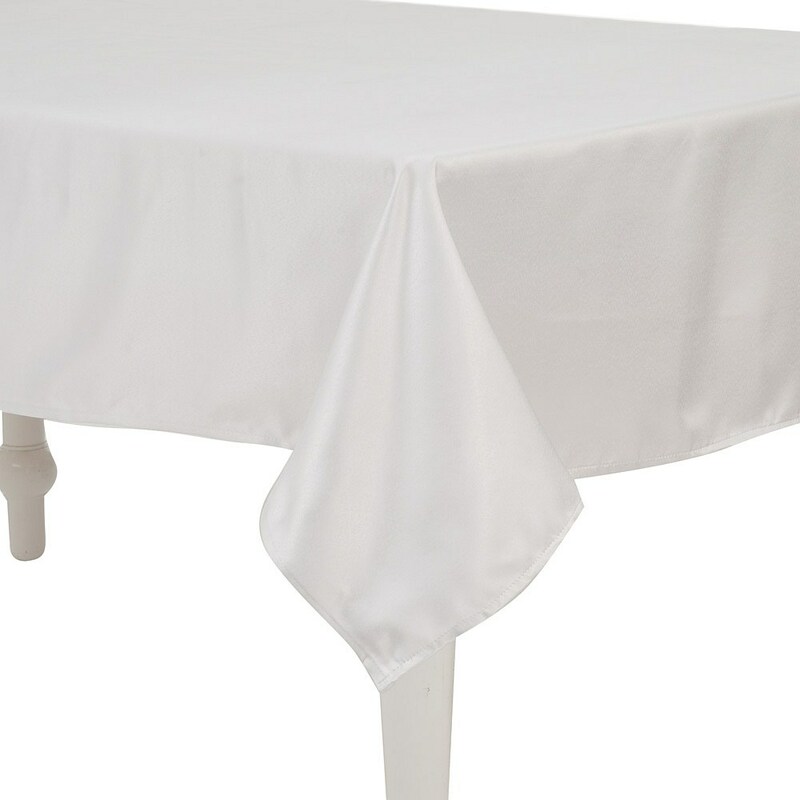 Hire a child size table and cover with a nice tablecloth. I always use a fabric tablecloth in white or a plain colour that works with my theme, I recommend the same if using a plastic cover. Fabric tablecloths can be hired from your local party supplier or you can buy plain ones at Kmart for around $10.00 (make sure you iron it, before putting on your table!) Plastic table covers can be purchased at party stores or shops like Reject Shop, Kmart etc. I like to set both a dinner plate and dessert plate on my table. I usually opt for a plain dinner plate and then set a themed dessert plate on top/middle of the dinner plate. With my cup I tend to use plain/patterned style and then add a paper straw (again make sure your straws are all set the same way and not just popped in the cup). Here are two examples of different themed plates matched with plain patterned tableware. Using mostly plain accessories gives you a stylish and classy look and when you add a splash of theme it becomes a feature and doesn't overpower your table. A pretty table runner can add a nice touch to the center of your table in a style/colour that compliments your theme. 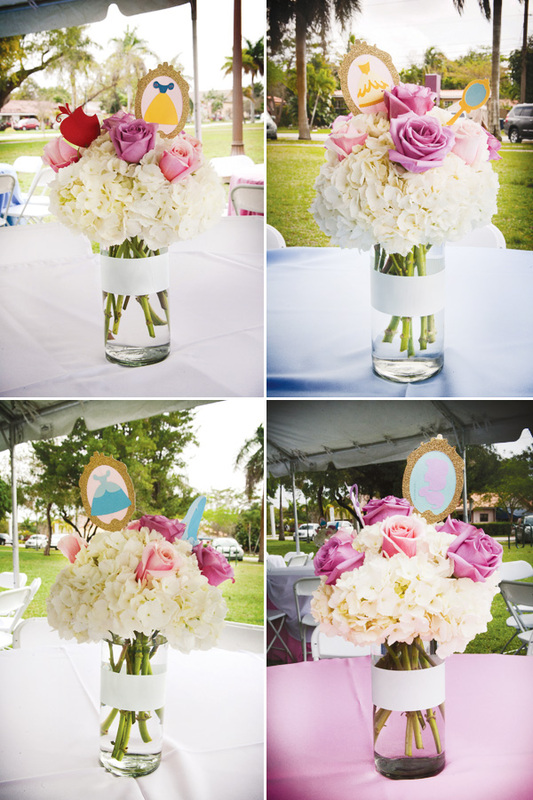 Themed centerpieces can be purchased in most themes, though you can also decorate with other things such as props - dolls etc, balloons or pretty flowers. 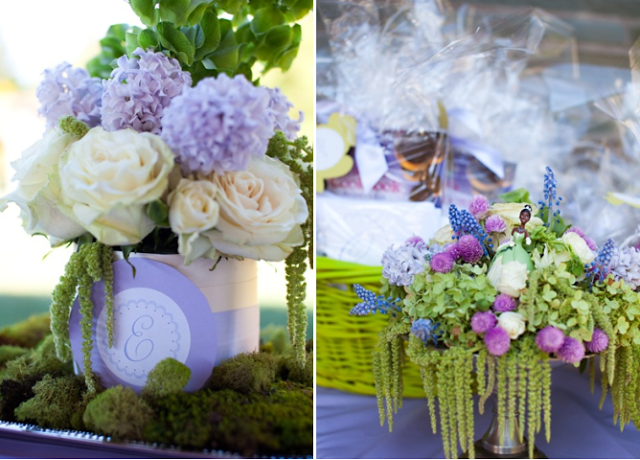 You cant go wrong with a beautiful bunch of fresh flowers on your party table, as seen on this gorgeous party by Iheartsugarsugar. They have added some cute little Princess embellishments into the arrangement and they make a simple but very pretty table piece. Another beautiful floral centerpiece arrangement, also incorporating a little Princess Doll by Kiki's List. I love to have my party bags in view at the party (but up high so little ones cant get hold of them early). Party Bags are a lovely way to send off your guests and its nice to carry your party theme/feel into your bags as it is the last memory a guest will have of your party. I love using party boxes myself and love the look of plain bags or boxes with a pretty gift tag or ribbon. There are so many beautiful party decorations you can buy or make that can beautifully compliment your party. 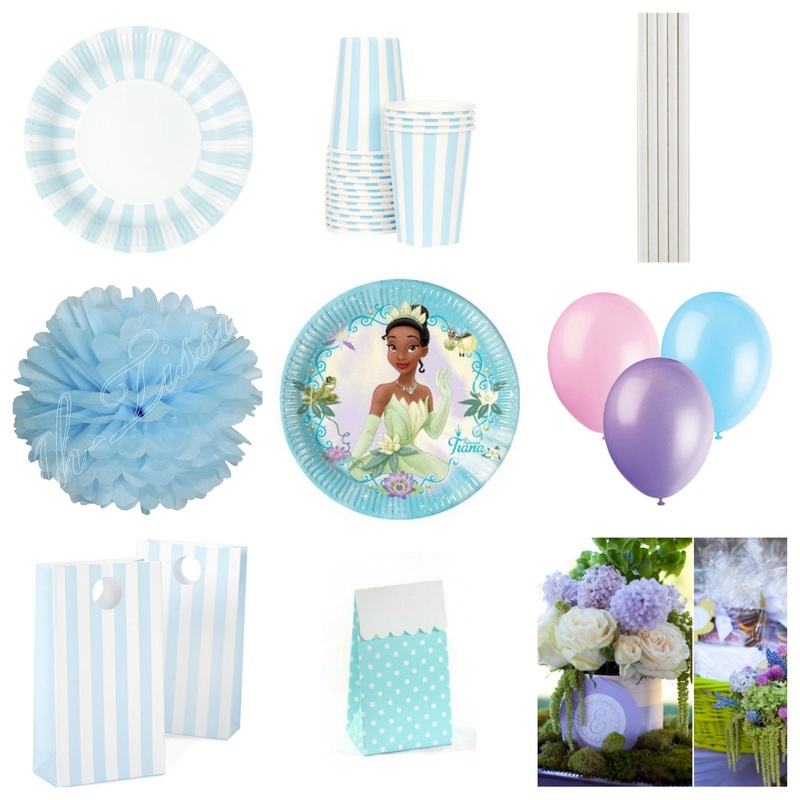 Balloons, tissue paper pom poms or fans, paper garland, buntings & more! Put 'em together and what have you got bibbidi-bobbidi bibbidi-bobbidi bibbidi-bobbidi-boo! Both selections look really pretty together and we have created a stylish set up whilst still having a fun licensed theme incorporated in. I hope some of these little ideas can help you see licensed parties in a different light :) I will be back soon with a follow on post on the Disney Princesses theme and provide more great info on where to buy supplies and fun food and cake ideas.